In our latest instalment of our running series, we took a look at the Great Wall of China. Today we&apos;ll be talking about how people have taken advantage of one of nature&apos;s finest creations – the Grand Canyon. The Grand Canyon is considered to be one of the wonders of the natural world, and it&apos;s not hard to understand why. The incredible canyon was carved out of the rocks by the Colorado River which is thought to have established its course 17 million years ago. The canyon is 277 miles long and, in certain places, reaches a depth of 1 mile. For thousands of years, humans have been fascinated by this incredible sight and have arrived in droves to view it for themselves. 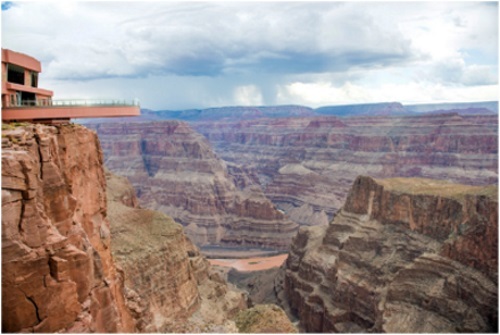 This is why, in 2004, production began on the Grand Canyon Skywalk that would offer a view like never before. An entrepreneur named David Jin came up with the idea for the skywalk and employed the help of architect, Mark Ross Johnson to turn it into a reality. The walkway itself stretches out 70 feet from the edge of the canyon and looks as if it is floating. This is due to the fact that there are no direct supports from underneath. The bridge is actually supported by beams that are anchored deep within the rock which act as counterweights. This means that the walkway is so strong that it is said to be able to withstand the weight of 71 fully loaded 747 planes or 800 people! The walkway itself is made with four layers of Saint-Gobain Diamant low iron glass which has a protective layer over it to protect from scratches and marks as it can be removed and replaced with ease. The Grand Canyon Skywalk truly is a remarkable feat of engineering and shows how brilliantly we can work alongside nature to create something extraordinary. Here at European Springs, we work with a huge variety of industries which means that we are passionate about playing our part in the advancement of engineering. We have a wide range of products such as disc springs, motor springs and medical springs, so whatever the industry, we can provide. For more information about any of our products, please don&apos;t hesitate to get in touch with us today by calling 0208 663 1800 to speak to a member of our friendly team.